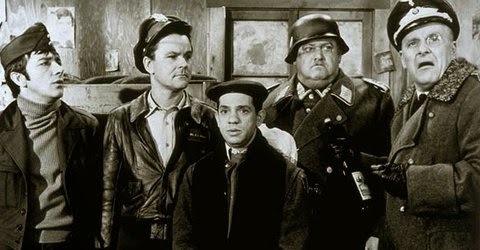 Hogan’s Heroes aired from 1965 to 1971, beginning twenty years after World War II. The television show received much criticism for trivializing war and Nazism. Many mistook it for a concentration camp, which it was not. Hogan and his men were prisoners of war in a luft stalag, a prison camp for airmen. The prisoners routinely made their captors look like buffoons. They got away with atrocious schemes because of the ineptness of the Germans. The actors portraying the Germans would certainly not have wished to sanction Germany’s actions during the war. John Banner (Sgt. Schultz) was born in Vienna, Austria, in 1910. He was performing in Switzerland at the time of the Anschluss. As a Jew, he could not return home, and arrived in the United States as a refugee. Werner Klemperer (Col. Klink) was born in Cologne, Germany, in 1920. When Hitler came to power, Werner’s father, symphony conductor Otto Klemperer, was condemned for being Jewish. Foreseeing the danger, Otto moved his family to Vienna in 1933, and to the United States in 1935. Werner set a condition on his role as Col. Klink. Klink could never come out the winner in a confrontation with the prisoners. If he did, Klemperer would quit. Leon Askin (Gen. Burkhalter) was born in Vienna in 1907, and had worked with John Banner on stage before either emigrated. He had a contract with the Louise Dumont Playhouse in Germany when Hitler became Chancellor in 1933. Askin was dismissed for being Jewish. He was arrested and beaten by the Gestapo. After the Austrian Consul got him released, he fled to Paris. He worked there and in Vienna until the Anschluss. For six months, he was held in a French prison as an Austrian enemy until the American visa he’d applied for came through and he came to the U.S. in March, 1940. Howard Caine (Major Hochstetter) was born in Nashville, but he too was Jewish. He took the role to portray the Gestapo agent as a madman. He provided a contrast between the ruthless Nazi and the bumbling fools (Klink and Schultz) who were not members of the Nazi Party. Of all the cast members, it was Robert Clary (French Corporal Louis LeBeau) who had the worst experience at the hands of the Germans during World War II. Born in Paris in 1926, he spent three years in concentration camps for being Jewish. He was the only survivor of thirteen family member sent to the camps. All of them were asked how they could do Hogan’s Heroes. The television show was a parody never meant to portray a real prisoner-of-war camp. Not being based in reality, it featured absurd situations that remain funny to this day. Too bad that was before iPhones, Peggy; you could have snapped his picture! Thanks for stopping by. Actually, Connie, I did get an idea for spicing up a scene in one of mine!